It is Friday and time for the Friday Five! 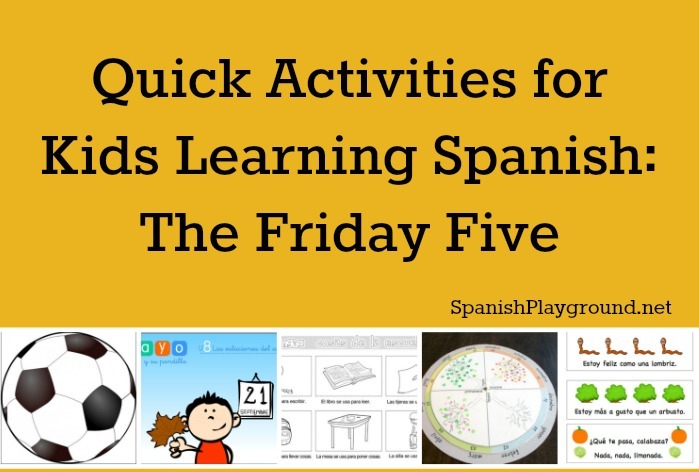 These activities are for kids learning Spanish, and they take little or no preparation. Kids will hear and speak Spanish as they play games, listen to a story or do a craft. So, add a little Spanish to your weekend or the week to come with these ideas for kids learning Spanish. Check out the rest of the Friday Five series! 1. Listen to and sing this song with school vocabulary from Rockalingua. There is a lyric sheet with drawings to reinforce the meaning of the words. Kids learning Spanish at school will be familiar with much of this vocabulary. 2. Make these printable bookmarks with funny rhyming phrases in Spanish. These are phrases used in Spanish-speaking countries much the way you can say “See you later, Alligator” in English. Just print the bookmarks on cardstock and cut them out. Some are black and white so that kids can color them. Then, use the phrases with your child! This is a fun way for kids learning Spanish to practice pronunciation and rhyme. 3. Practice Spanish and soccer skills at the same time. Put words, letters, numbers or pictures on cardboard and tape them to cones or buckets. If you use big pieces of light cardboard you can just fold them into tents with the words or letters on both sides. Spread the words out over the playing area. Call out a word and kids dribble over to it. Put subject pronouns on the labels and call out a verb form. They dribble to the matching pronoun. Put vowels on the labels and call out a word that starts with a vowel. They dribble to the correct vowel. Call out a word or letter and kids try to hit the correct one with the ball. Get creative! Use letters as labels so kids can spell words by dribbling or shooting. Use words as labels so kids can make sentences.There are lots of possibilities. 4. Make this pretty seasons wheel from El hada de papel. Talk about the seasons as you cut, color and assemble the wheel.